You’ve spent weeks sending out your latest resume, looking for a new role to either progress your career or take you onto the next rung of the salary ladder. Congratulations, looks like you’ve landed yourself that all-important interview! Now all you have to do is wow your future employer with your relevant skills, industry expertise, powerfully engaging and charismatic personality, and of course, how well presented and turned out you are for the occasion! There you were thinking the application process was the hard part. What are the best interview outfits to wear? So the next question is, what are you going to wear? Does any of it still fit you and is it even clean or do you need an emergency dash to either the nearest shopping mall or dry cleaners? Well in part, the job interview attire you end up wearing is going to depend upon exactly what kind of role you have applied for. A young and dynamic business start-up might cut you a bit more slack than a traditional blue-chip employer when it comes to their expectations of appropriate interview attire. The key then is to dress appropriately for the position. You want to be what is best described as “business casual”. By that we mean there’s no need to wear a three-piece suit which would be altogether too formal for a first interview. Instead, you might opt for a stylish pair of dress pants, a nice plain and conventional dress shirt, along with a decent pair of nicely polished dress shoes in black or brown depending upon the rest of your outfit. Shoes make all the difference when finishing off your overall look so do make sure that they are clean and you have given them a good polish and removed any scuff marks before you head into any interview situation. Shoes are an essential part of your outfit and shouldn’t ever be treated as just a final afterthought. Give some proper consideration to what you are going to wear and don’t just throw something together on the morning of your interview. 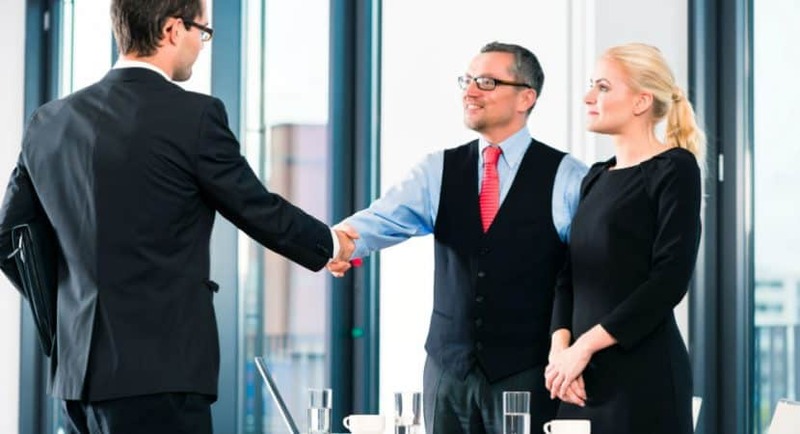 First impressions are crucial and you want to make the best possible one to your potential new employer so make sure that you are very much dressed for success. There’s no need to go overboard, spending your already imagined full next month’s salary on something new and achingly hip either. This isn’t a fashion show; it’s an interview so your outfit should be intelligently thought out and pulled together in a tasteful and professional way. That said, there’s no reason why it shouldn’t reflect your personality either, but steer clear of wacky colored ties and the cartoon character socks your aunt gave you last Christmas. They might well make an impression but it won’t be the one you are looking for. Think about the colors you wear and combine together too, and go for classic and contemporary ones like navy blue, charcoal grey, a classic black or maybe even a nice taupe dress pant teamed with a clean and stylish white dress shirt. This is a simple but very smart and polished overall look which will at the same time be impressive without being overwhelming. If you are unsure whether the company you are interviewing for prefers a more casual or formal look, then a great compromise is a Sports Blazer with a pair of coordinated pants. Worn without the formality of a tie but again, with a very smart well-polished pair of leather dress shoes, this is a great look for any interview situation. Don’t ever think that you can get away with wearing running shoes to a job interview, please. If you are confident that a more casual look is going to be entirely appropriate then a simple wool V or round neck sweater, over a button down plain shirt is a great interview outfit along with perhaps a pair of more relaxed style chino pants. If you’re interviewing at a tech or marketing savvy start-up you might even be so bold as to wear a pair of smart, dark wash jeans but be absolutely sure first that this look will be appropriate as you certainly don’t want to ruin your chances of a new career because of the pants you were wearing! What about a classic blazer? If you do need to invest in a new piece to upgrade and compliment your current interview look, then a great investment would be a navy blue blazer. This is such a classically cool and versatile piece of statement clothing that quite frankly, every self-respecting man should own, regardless of how fashion savvy they might be. Navy blue is a great base color as it goes well with many other options and can be worn just as easily with dress pants as it can with more casual slacks, a pair of chinos, or even your denims. You will get years of wear from a blazer. Should you wear a tie? When it comes down to ties, that’s entirely up to you and depends upon how comfortable you feel wearing one. You might feel that a tie gives you that extra important “edge” and helps you up your interview game. In which case, go ahead and wear one. Don’t be afraid to go for a bold statement option either, just no kid’s TV characters. Options for shirts are again varied and a matter of personal taste. While you can’t go wrong with a simple white dress shirt, if the interview does allow for you to be a bit more business casual, then express your own personality with a bold colored shirt that gives you confidence and charisma. Just make sure that you are the one that is doing the talking and not your clothes. Don’t be afraid to play around with different fabrics and textures. A tweed blazer is a smart option or perhaps even a corduroy one too. It doesn’t always have to be wool or a nylon blend. The rules for interviewing are pretty simple, really. Look the part, so that you can act the part. Bring your confidence along with your A-game and always make sure that your shoes are well polished, your shirt is ironed, and your pants are freshly dry cleaned or laundered. These top tips on how to dress for an up-coming interview should have you well on your way to landing that coveted position. The rest is up to you and how perfect of a fit you really are. So good luck and remember to always dress the part.